One of several fantastic quotes from Kenny Dixon Jr during a RBMA lecture back in 2010. KDJ could easily have several books written about his social activism or achievements, let alone the endless amount of sites showcasing his entire back catalogue of production; so we’ll keep it short & focus on two EP’s. In addition to this, the original pressing of each record comes with a Ron Murphy stamp. The late Murphy is one of the most respected figures, not only amongst the Detroit community, but also the record community. He was a mastering engineer, record cutter & producer. A career spanning over four decades, Murphy’s first engineering job was a mo-town record performed by Forest Hairston, written by Larry B.Carter in 1966. In 1989 Murphy & his business partner Steve Martel started National Sound Corportaion in W.Warren Detroit, which was later renamed Sound Enterprises. Amerika begins with a sample from ‘Bicentennial Blues’ by Gil Scott-Heron record live in 1976 for his double LP ‘It’s Your World’. A guitar lick from Idris Muhammed’s “Turn This Mutha Out” is looped softly underneath the poem until crisp, snapping kicks take over the track. Originally limited to 200 until being repressed in 2005, J.A.N. 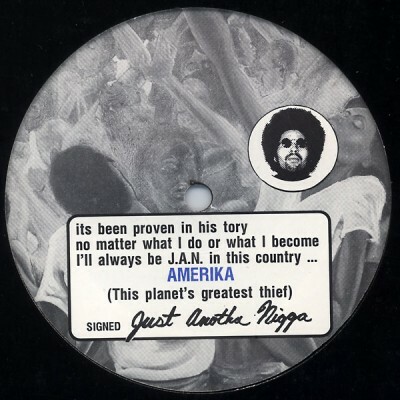 was meant to be KDJ#16, however after the controversy surrounding ‘Amerikkka’ it was initially pulled from pressing, until finally released in April 2001. The vocal snips were taken from an interview with Prince conducted by legendary radio jock Electrifying Mojo. The rolling analogue baseline drives over the top of interview samples & jabbing strings for almost seven minutes before KDJ effortless glides the track into a melodic stripped back house classic.